Power Pak is one of the leading week-long dance intensives in the convention world. 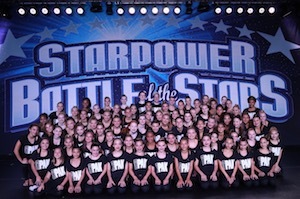 It offers a unique experience for all who are invited with opportunities to take master classes from the best of the best, open Starpower’s Battle of the Stars, earn scholarships, and awards to attend other competitions and conventions affiliated with Power Pak. Our classes are small in size, giving the dancer a more “one on one” feel with the choreographers and master teachers. You can receive an invitation to Power Pak from any of the Star Dance Alliance Events. The Power Pak week includes classes in a variety of genres and styles, including: ballet, jazz, tap, contemporary, hip hop, lyrical, musical theater, acting and improvisation, and much more! Sky Hoffmann, Ade Obayomi, Jason Williams, Mark Orsborn, Zach Heller, Marinda Davis, Jill Wolins, Wyatt Rocker, Emily Brown and many more!